When McAllen Mayor Jim Darling heard the monarchs were in trouble, he decided to take action. Darling signed the National Wildlife Federation’s Mayors’ Monarch Pledge, committing to restore habitat for the iconic butterfly in McAllen, Texas, and encourage its citizens to do the same. He joined other signatories in Mexico, Canada and the United States — nearly 80 in Texas alone. The pledge outlines actions communities can take that will help, from striking milkweeds (Asclepias spp.) from noxious plant or “weed” lists to planting native nectar plants in medians and public rights-of-way. Mayors must agree to initiate at least three actions within a year from taking the pledge; McAllen and San Antonio both pledged to take all 24 actions suggested by NWF. Twenty years ago, more than one billion monarch butterflies (Danaus plexippus) migrated south to Mexico for the winter, roughly following Interstate Highway 35 (which reaches as far north as Duluth, Minnesota) through the middle of the U.S., right over Texas. In the winter of 2014, only 60 million made the trip; the North American monarch population has declined by more than 90 percent over the past two decades. Scientists attribute the decline to degradation and loss of habitat in both the U.S. and Mexico. That’s where the pledge comes in. “We have one of the World Birding Center sites, Quinta Mazatlan, and the manager asked if I was interested in taking the pledge,” Darling says. 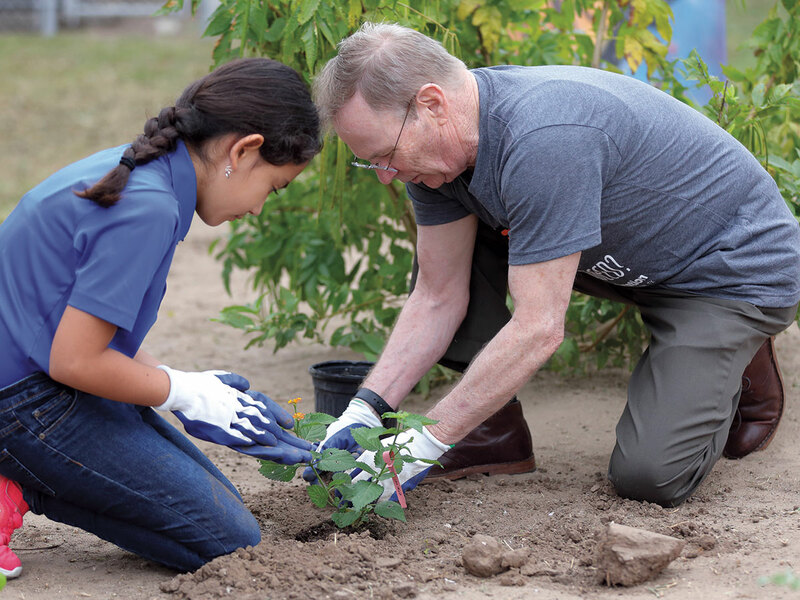 “I had read about the monarch’s journey and thought, ‘What a journey that is,’ but I wasn’t aware of their habitat needs.” Schools, city parks and other facilities throughout McAllen have installed native plant gardens, and Darling even planted one in his backyard. Colleen Hook, the Quinta Mazatlan manager who started the ball rolling, stresses the benefits of having the mayor involved. “I can pick up the phone and call city departments or businesses and say I’m calling on behalf of the mayor. It makes it a citywide project.” NWF, she adds, provided tools and a roadmap for increasing habitat in the city. The Mayors’ Pledge focuses on partnering with other groups and individuals in a community, creating monarch conservation networks for each city that signs. It also complements other NWF programs, says Rebeca Quiñonez-Piñón, outreach coordinator for a Central Texas network that includes Monarch Heroes, a program encouraging children to help create gardens. Bring Back the Monarchs, a Native Plant Society of Texas program, also encourages collaboration to increase urban monarch habitat, providing public institutions with grants to purchase plants. NPSOT awarded 28 grants totaling almost $9,000 this spring; recipients range from public schools and church pavilions to courthouses and city and state parks. One grant recipient is the Dona Marie Clubhouse, a nonprofit psychiatric rehabilitation day center near Houston. Dona Marie volunteer Sharon Smith proposed a butterfly garden to the members, collecting seeds and obtaining a grant from NPSOT. After volunteers from several organizations helped plant the garden, Smith says nearly 100 caterpillars made their chrysalises on the home’s sunroom. “That got everyone interested because they could see it happening,” she says. Through its Project Milkweed, funded by the U.S. Fish and Wildlife Service, the Wildflower Center collects wild seeds and propagates native milkweeds. These species are adapted to the specific weather, pests and other conditions in Central Texas and are known hosts for monarch larvae (or caterpillars). Now in its third year, the project has donated more than 1,800 plants to NWF and other programs and provided more than 100,000 seeds to commercial and noncommercial growers. Darling finds it symbolic that monarchs freely travel all the way from Mexico to Canada. “There are no borders for the butterflies,” he says. And with enough native plants along the way, no barriers, either. Learn how to propagate milkweeds, here.